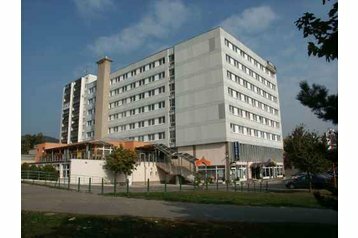 Hotel in capital city Bratislava, in the district Rača. In the hotel there is: restaurant, wine tavern, summer terrace, winter garden - cofee bar, 2x congress hall, 4x business saloon, pool, sauna, massages, hair dresser, beauty salon, florist´s. Wi-Fi for free. Parking - paid. Bus 200m. Train (station Bratislava - Vinohrady) 4km.